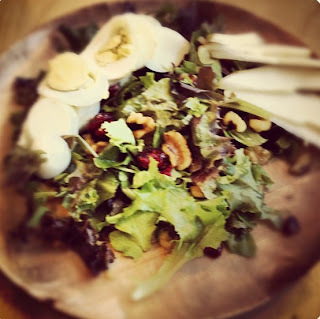 Paleo Girl's Kitchen: Back In Action With a Quick Salad! Back In Action With a Quick Salad! I've stopped blogging for a while, but now I am back! I can't promise how much I will post, but I am aboard the Paleo train. I'm sure many people have struggled with the Paleo lifestyle, but I am trying to get back to it! I'm going for 30 days strict with plenty of posts to keep me honest! This time around I'm trying to keep my meals on the simpler side on weekdays. I will definitely be posting some recipes on the fun side as well, so make sure to check in! Balsamic Vinaigrette (homemade, or all natural store-bought...look for low carb to avoid sugar). Makes a great easy lunch. If you have time add some diced chicken breast too! Yum! Your Salad recipes is very simple and we can make it easily. To make it not necessary to become cooking expert and everyone just follow your direction and make it easily then enjoy the taste of this salad. On the other hand, I like to know about this website which is http://writers-house.com/buy-term-paper-online/.